This is one example of Eliza Bennett’s “A Woman’s Work Is Never Done” series of embroideries on her own hand. The stitches are meant to make the hands look more worn, representing the struggles of primarily female-centric, lower paid, jobs of cleaning and caring. Eliza Bennet received a BTEC National Diploma in art, with a focus on textiles. She also has a background in Fashion Design from Middlesex University. She is London based. 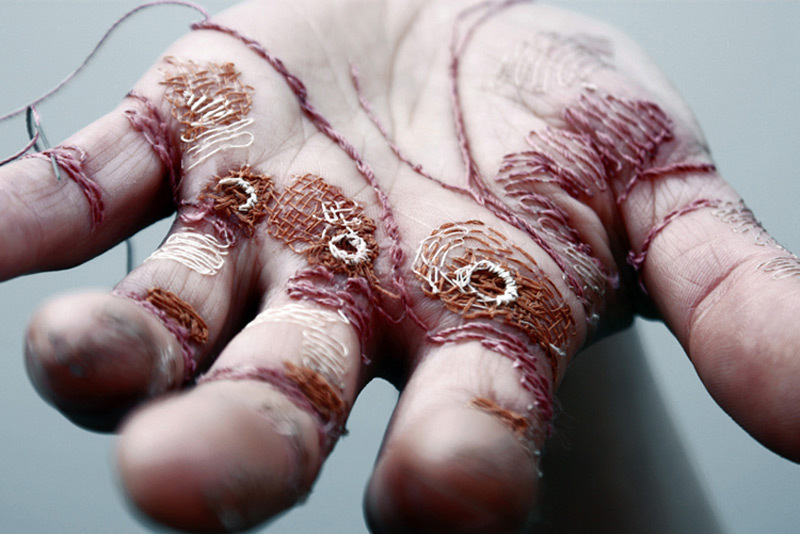 The actual hand work and craft in this visually narrative series of literal “hand embroidery” is somewhat disturbing to look at, but intriguing and beautiful at the same time. You can see more images of this series in Empty Kingdom’s feature on Miss Bennett. Eliza’s series reminds us of a project from a couple of years back where we embroidered into a model’s skin and hands as a celebration of Canada Day. When we created this image, were thinking of doing an entire series inspired by body embroidery, and Eliza’s work has made us think about going back to that early work, to make more of a statement about “suffering for fashion”. Stay tuned!